CDC Emergency Partners - Prepare for Hurricane Harvey Today! Hurricane Harvey is expected to affect areas in the United States. Please share the following information with those who may find it useful. CDC can help you make an emergency plan. 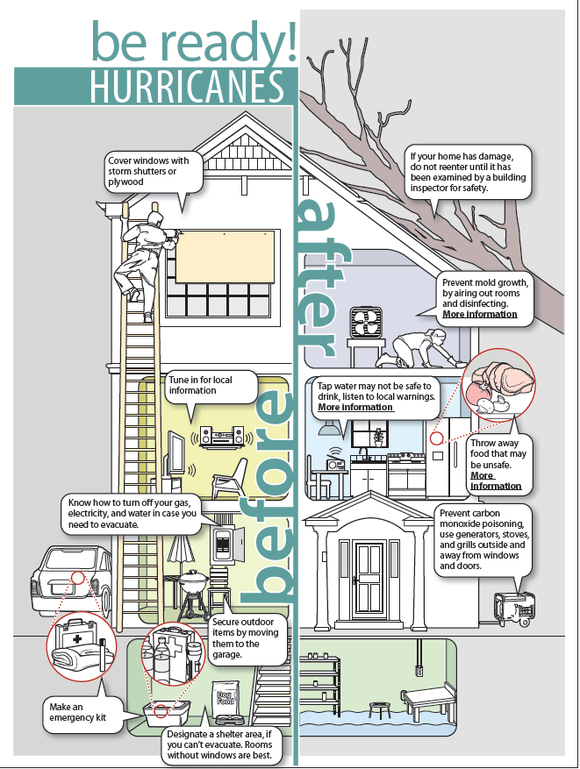 During and after a hurricane, you may need supplies to keep your family safe and healthy. Remember that a storm could cut off your power and water supply. You also may not be able to drive because of damage to your car. Roads may be flooded or blocked. Click here for a checklist. Use these tips to prepare your family, home, and car for a hurricane. If a hurricane is coming, you may hear an order to evacuate (leave your home). Never ignore an order to evacuate. Even sturdy, well-built houses may not hold up against a severe storm. Staying home to protect your property is not worth risking your health and safety.You may also hear an order to stay at home. Sometimes, staying at home is safer than leaving. Click the image or here to read tips about hurricane preparedness. It takes just 12 inches of flowing water to carry off a small car and 18 to 24 inches for larger vehicles. Over half of all flood-related drownings happen when a vehicle is driven into hazardous flood water. People underestimate the force and power of water. If you see a flooded road, turn around, don't drown! Public Service Announcements You Can Use! Click the image or here to access several PSAs and PSA scripts that can be used to encourage people to prepare for Hurricane Harvey. 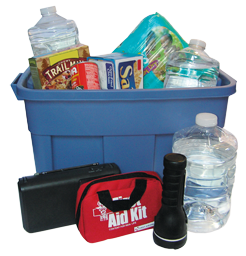 All resources can be found under the header "Preparing for a Tropical Storm or Hurricane". 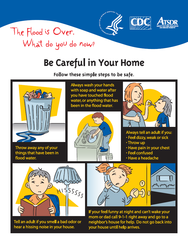 After a hurricane, it’s important that the water you drink and food you eat is safe. Spoiled food or dirty water can make you and your family sick. It’s important to remember that the danger isn’t over when the storm ends. Click here to get tips for how to keep your family safe after a hurricane. After a hurricane or flood, you may need to clean up your home and yard. Take these steps to stay safe. See the Homeowner's and Renter's Guide to Mold Cleanup after Disasters for more tips.